Sunderland AFC has been a member of the Football League since 1890. They have won the league six times and the FA Cup two times. They have also been runners-up in the Football League Cup a final once. The club is also known under a few nicknames, The Black Cats are one of them. 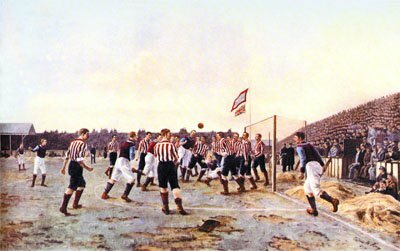 An old painting depicting Sunderland playing against Aston Villa in 1895. Sunderland was established in 1879. The “AFC” stands for Association Football Club. Together with Preston and Aston Villa, Sunderland was among the dominant football clubs in England during the 1890s, winning the First Division in 1891–92, 1892–93 and 1894–95. Their team were reinforced by imported Scottish players and they also played a passing game which for the time was typical Scottish opposed to the dribbling game that otherwise was an English trademark. Sunderland was, however, not as successful in the FA Cup, in which the participate for the first time in 1884-1885 season. After being the runners-up in 1923 they finally claim its first title in 1937.